This is the story about a Regatta Richard (4th person from left, with eyeglasses) participated in way out in Seattle in 1947. After World War II many men fresh from the armed services (Richard was in the Air Force having flown as a bombardier on a B29 out of Guam up until the last day of the war) flocked to universities on the GI bill. That caused the freshman turnout to outnumber the varsity so freshman teams were consistently beating varsity teams. This was the case at Syracuse University where Richard landed to complete his education which had been interrupted by his enlistment in the great war. 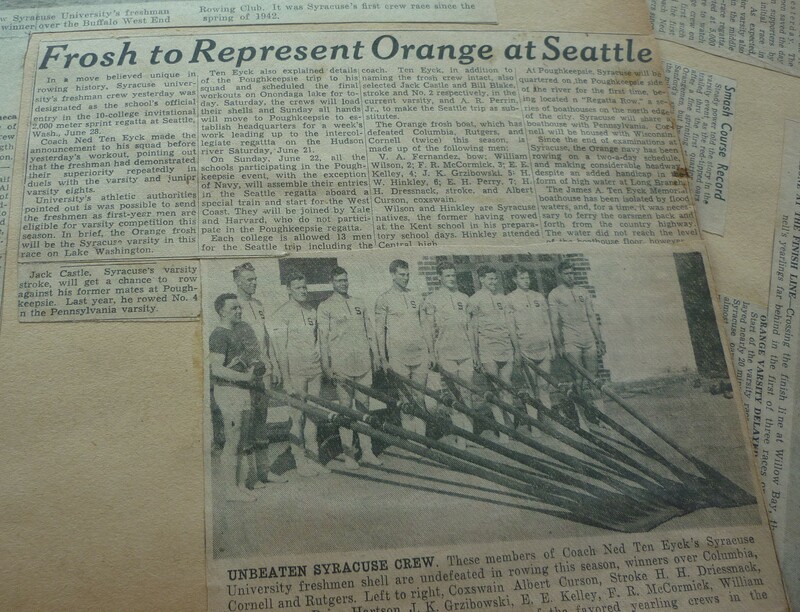 This Syracuse newspaper clipping that Richard shares here noted the event as “unique in rowing history” in that the freshman crew was designated as the school’s official entry in the 10-college invitational 2,000 meter spring Regatta in Seattle, Washington on June 28th 1947. (Note: “Orange” is the nickname for Syracuse University). Here is the full text of the article which, unfortunately is anonymous because the clipping did not include the author. In a move believed unique in rowing history, Syracuse University’s freshman crew yesterday was designated as the school’s official entry in the 10-college invitational 2,000 meter spring regatta at Seattle, Wash., June 28. Coach Ned Ten Eyck made the announcement to his squad before yesterday’s workout, pointing out that the freshman had demonstrated their superiority repeatedly in duels with the varsity and junior varsity eights. University’s athletic authorities pointed out it was possible to send the freshmen, as first-year men are eligible for varsity competion this season. In brief, the Orange frosh will be the Syracuse varsity in this race on Lake Washington. Jack Castle, Syracuse’s varsity stroke, will get a chance to row against his former mates at Poughkeepsie. Last year, he rowed No. 4 in the Pennsylvania varsity. Ten Eyck also explained details of the Poughkeepsie trip to his squad and scheduled the final workouts on Onondaga Lake for today. Saturday, the crews will load their shells and Sunday all hands will move to Poughkeepsie to establish headquarters for a week’s work leading up to the intercolligiate regatta on the Hudson River Saturday, June 21. On Sunday, June 22, all the schools participating in the Poughkeepsie event, with the exception of Navy, will assemble their entries in the Seattle regatta aboard a special train [ Note: see more about this “special train” here: http://en.wikipedia.org/wiki/Olympian_Hiawatha ] and start for the West Coast. They will be joined by Yale and Harvard, who do not participate in the Poughkeepsie regatta. Each college is allowed 13 men for the Seattle trip including the coach. Ten Eyck, in addition to naming the frosh crew intact also selected Jack Castle and Bill Blake stroke and No. 2 respectively, in the current varsity and A. R. Perrin, Jr. to make the Seattle trip as substitutes. V. A. Fernandez, bow; William Wilson, 2, F. R. McCormick, 3 [Note: this is Richard McCormick’s full initials] ; E.F. Kelley, 4; J.K. Grzibowski, 5; H.W. Hinkley, 6; E.H. Perry, 7; H.H. Dressnack, stroke, and Albert Cuurson, coxswain. Wilson and Hinley are Syracuse natives, the former having rowed at the Kent School in his preparatory school days. Hinkley attended Central High. At Poughkeepsie, Syracuse will be quartered on the Poughkeepsie side of the river for the first time, being located in “Regatta Row,” a series of boathouses o the north edge of the city. Syracuse will share a boathouse with Pennsylvania. Cornell will be housed with Wisconsin. Since the end of examinations at Syracuse, the Orange navy has been rowing on a two-a-day schedule, and making considerable headway, despite an added handicap in the form of high water at Long Branch. The James A. Ten Eyck Memorial boathouse has been isloated by flood waters, and for a time, it was necessary to ferry the oarsmen back and forth from the country highway. The water did not reach the level of the boathouse floor however.